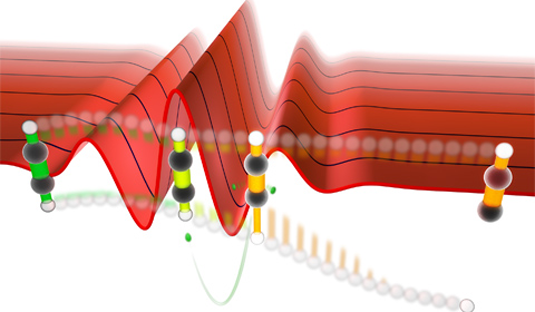 An international team of scientists discovered a new quantum control mechanism to selectively shake and break C-H bonds in symmetric hydrocarbon molecules with the waveform of femtosecond laser pulses. Chemical bonds between carbon and hydrogen atoms are amongst the strongest in nature and their selective breaking, in particular in symmetric molecules, is of interest to chemical synthesis and the development of new biologically active molecules. An international team of scientists has now demonstrated that ultrashort light pulses with perfectly controlled waveforms can selectively break C-H bonds in acetylene ions. The researchers demonstrated that a suitable choice of the laser-pulse waveform leads to breaking of the C-H bond on the left (or right) side of the symmetric H-C≡C-H molecule. The scientists propose that their results can be understood by a new quantum control mechanism based on light induced vibrations (Nature Communications).